Hughes, L.S., Krug, N.P., & Vye, S. (2011). The growth of an out-of-class learning community through autonomous socialization at a self-access center. Studies in Self-Access Learning Journal, 2(4), 281-291. This study investigates the benefits of attending the Saitama University English Resource Center (ERC), a self-access center for English language learning open to all students at the university and managed by full-time faculty who alternate as center advisors. The study builds on previous research to explore how advisors promote language learning through facilitating autonomous socialization in the L2 among center attendees. This authentic social interaction not only exposes learners to patterns of discourse and other language input unavailable to learners in most institutional settings, it has also served as the means through which visiting students have formed an out-of-class learning community that now extends well beyond the center’s walls. Findings of a significant increase in center attendees and meaningful gains in the number of frequent attendees over the past year provide evidence that supports informal observations of the growth of this extraordinary L2-based community. Two previous studies revealed that students who attended our self access center (called the English Resource Center or ERC) experienced gains in their English proficiencies that were more than double those of students who did not attend (Vye, Krug, Wurzinger, and Hughes, 2011; Krug, Wurzinger, Hughes, and Vye, 2011). In addition, Krug et al. (2011) found a positive relationship between the number of times students attended the ERC and the amount their proficiency rose. Although these findings were encouraging, the studies also raised further questions. For example, assuming that ERC activities indeed account for the observed gains, what exactly is it about ERC activities that would promote such extraordinary proficiency growth? Furthermore, although the increases in proficiency can be seen as evidence of the success of our center in addressing learner needs, there are of course other factors that must be considered. In particular, as the center is open to all students enrolled at the university and attendance completely voluntary, an investigation for increases in the number of attendees and frequency of attendance over time would prove valuable in giving us a clearer picture of how our center serves our student body. After providing a basic overview of the ERC and its activities, the present study addresses the main questions introduced above. Specifically, this study explores how the emphasis on autonomous social interaction at our center likely contributes to the previously observed proficiency increases while also encouraging the growth of an autonomous community of L2 users which further reinforces out-of-class language learning. Finally, this study examines ERC attendance data for quantitative evidence of the growth of this community over the past year. The ERC is located within the Center for English Education and Development (CEED) at Saitama University and has provided an English learning environment available to the university-wide community since 2004. The ERC is open 3:00pm to 5:00pm from Monday to Friday and serves as a space for learners to improve their English skills outside of class. The center moved from a borrowed portable structure situated in a remote area of the campus to its current location in 2006, which was a success story in itself as previously the center had no fiscal support and relied on donations of English resources from instructors as outlined in Vye, Barfield & Anthanasiou, (2010). The ERC is visible from the hallway via a glass wall, where anyone joining can view the activities that are occurring and conceivably feel more comfortable entering the facility than if the room was not visible from the outside. In addition, the entrance dons a Japanese language sign that advertises, “Anything (you want to) Consult (about) English Room,” and perhaps as a result, attendees’ come with a diversity of queries and English language goals. The physical space of the ERC is rather pleasing to the eye as the windows opposite the entrance overlook a grove of trees and greenery. The walls to the left and right of the windows hold our updated collection of DVDs, graded readers, language study and test preparation guides, and books which are now available to students to borrow thanks to a number of grants from the University in the past three years. These grants have also allowed the provision of new computers, a projector, and various media players to enhance language learning. The ERC can comfortably accommodate about 25 learners at a time with four different spaces to gather and relax in, surrounded by various posters, plants, and the borrowed scenery outside the windows. Our learners have continually remarked that the current location is more relaxing and less ‘institutional’ than other places on campus. Even as the center continues to grow and the advisors work on the challenges this growth brings, the calming elements of the room provide a valuable sense of stability, helping new-comers to relax and feel more at home. Perhaps the best way to describe the main activities of our center is by contrasting them with those that typify English courses at our and other Japanese institutions. 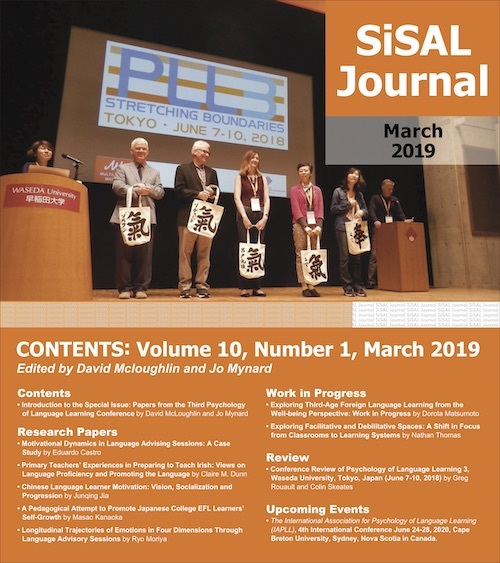 First though, in order to make this contrast accessible regardless of the reader’s background, we provide a very brief overview of the current general state of university language teaching in Japan. Despite the growing popularity of communicative, learner-centered approaches to language education in Japan, much of the language teaching, particularly at the secondary and tertiary levels remains teacher-centered and often tends toward grammar-translation or the similar “yakudoku” approach described by Hino (1988). Even the more communicative courses tend to adopt what Friere (1970/ 1993) would call a “banking” view of learning, wherein pre-determined knowledge and skills are “deposited” into learner’s minds by the teacher. Rossatto (2005) explains how the banking approach to learning results from an over-emphasis on exams by education systems— and with Japan’s high school entrance exams, its center exam for entering university, and its abundance of private cram schools to prepare students for these exams, it is safe to conclude that Japan’s education system is indeed fixated on testing. Currently, at our university the fixation does not end with admission to the school, but continues on in the form of preparation courses for the Test of English for International Communication (TOEIC), which far outnumber the other English courses offered to the general student body. Peering into one of these TOEIC classes, one would likely see the teacher-as-banker working hard to deposit test tactics, vocabulary, and grammar points into the heads of largely passive students via lectures and receptive-skill-oriented textbook activities. Our center resides on the opposite end of the language education spectrum. First, whereas English courses at our university tend to be teacher-centered, there are no “teachers” in the traditional sense at the ERC during open hours. Instead, the full-time faculty members who staff the ERC take on the role of advisors whose main task is facilitating English communication and rapport between the students who visit and then stepping back and letting learners autonomously develop and manage their interactions. Meanwhile and as previously mentioned, student attendance is completely voluntary: Students may come and go at anytime during open hours. There are no tests, grades, or point systems save for a simple rule which asks both students and advisors to donate ten yen to the center for every word of Japanese they speak (and so speaking Japanese is technically not against the rules—it is just expensive). Thus, our center primarily serves as a meeting place for students to engage in target-language conversation and build friendships through the medium of English, and while an advisor is on hand to provide help if it is needed, the focus of students’ attention is on each other, not on the advisor (student activities in the ERC are further described in the next section). Of course, advisors also take on other, more traditional responsibilities, such as assisting students with English papers and speeches and advising those seeking more effective language learning strategies. In addition to serving as a site explicitly to engage in ‘conversation-for-learning’ (Kasper, 2004), the ERC environment fulfills a number of other roles. First, it functions as a space to borrow resources, offering a large collection of DVDs (popular movies, documentaries and TV series), graded readers (including well-known collections by Oxford and Cambridge), novels, and language resource books. Attendees can freely access all resources during ERC hours as well as borrow them for further self-study outside of the ERC. Secondly, while the ERC is closed, teachers often make use of the room for their regular classes, as its assortment of resources and technological equipment makes for a stimulating learning space. Thirdly, advisors frequently make use of the ERC for supplementary tutorials. Finally, the ERC serves as a site for extra-curricular events— including, for example, annual student-led drama productions, speech practice events, independent research seminars, and social gatherings (see Krug et al., 2011, and Vye et al., 2011). The foreign language environment tends to be characterized by limited opportunities to participate in authentic target-language interaction outside of the formal language classroom. This includes the settings in which many English as a foreign language (EFL) learners in Japan find themselves, often even when they are motivated to engage more actively in English. Commonly, in the formal language classroom in Japan (as was implied above in relation to Japan’s emphasis on testing) the teacher governs interaction with teacher-initiated ‘initiation-response-feedback’ (IRF) (Sinclair and Coulthard, 1975) exchanges—facilitating task completion and the efficient conveyance of the main points of a lesson but limiting other exchange patterns and ways of learning. Even in tasks that focus on meaning and fluency, the teacher as head-of-the-classroom has a direct influence upon the pattern of interaction. Markee (2000) does not deny the importance of such ‘institutional talk’ (Drew and Heritage, 1992), but he also emphasizes the value of ordinary conversation for language learning. Thus, one of the most important functions of the ERC is to provide our learners with the opportunity to take part in English-only target language practice and conversation-for-learning in which, as previously mentioned, advisors relinquish any controlling influence they may have on attendee interaction. During conversation-for-learning activities, students seat themselves in small groups and manage their own interactions including group size, activities engaged in, length of conversations, and topics discussed. The ERC, then, supplements formal language classroom activities within the university (i.e., institutional talk) by allowing and encouraging learners to experience forms of interaction that are more like ordinary conversation (i.e., what Drew and Heritage (1992, p. 27-29) term ‘non-formal’ institutional talk). In the ERC environment, learners assume responsibility for the management of talk-in-interaction. As learners manage their own discussions and interactions they are able to experience a wide variety of interactional practices in English, such as inviting others into a conversation, leaving (and even returning to) a conversation, and sustaining conversation. Providing learners with opportunities to experience such practices is not only important for second language (L2) development, but moreover helps learners establish deeper social ties with each other via the L2. These ties then become the springboard for out-of-class learning community development. As the advisors Adriana Edwards Wurzinger, Leander Hughes, Nathan Krug, and Stacey Vye’s increasing commitments stretch beyond the ERC in the CEED, the number of advisors present each day, whose roles are explained earlier in the paper, has decreased from two to one since the spring of 2010. Meanwhile, the number of attendees visiting each day has risen significantly (see the next section for details). Our learners can come and go in the center as they like without making appointments with the advisor. Some of the learners attend the ERC more frequently than others, while a few of them come to simply borrow resources. Various successes have risen from this development and two initial success stories that have sprung from authentic out-of-class experiences are described here subsequent to the explanation of the changing role of the advisors. Previously, with two advisors in the ERC per session and with fewer attendees, there was a tendency for communication to be controlled by the advisors rather than by the learners, perhaps because the former advisors conducted activities in which learners became used to following the advisors lead (we are not quite sure what the activities actually were). Interestingly, this dependence on the advisors may have also been an unintended effect of the previously mentioned Japanese name for the center (“Anything (you want to) Consult (about) English Room”), which implies that the role of advisors is to give explicit guidance and advice, while the learner’s role is to listen and take note. Conversely, with one advisor present at each session along with a steady increase in attendees, there has been a natural tendency to step back and listen to the needs and concerns of attendees. With this change came a shift from the learners predominantly consulting the advisor to asking peer advice from each other, as the locus of control passed into the hands of the learner with the increased social interaction described in the previous section. Furthermore, with the supplementary grants, we were able to purchase new materials based on attendees’ feedback that were closer to their learning needs. For example, some books that were on loan by a teacher that were difficult in level and content that had never been borrowed were returned and more level appropriate resources such as graded readers, TOEFL preparation guides, writing style guides, global issue resources were purchased. We thus saw evidence of out-of-class learning that was initiated by the learners using resources according to their own pleasure and interest in the content and in the language learning itself (Benson, 2011, p 39). In addition, and as Benson (2011, p. 40) has also observed, ERC advisors noticed that out-of-class learning requires some degree of autonomy, which varies from person to person, therefore, there is a variety in how individuals engage in this authentic learning. Several instances of these interactions and their implications are explained below. Examples of out-or-class learning successes extend beyond what was on our radar screen in the ERC regarding learner goals. One account of out-of-class learning success was indicated by a trend showing how the learners recommend resources to each other documented on borrowing cards. Perusing the cards, we noticed that friends and acquaintances seemed to be recommending resources to fellow peers, a pattern of peer-advising that we had not been aware of or observed up until that point. This pattern was evident in at least 30 instances, where clusters of friends (many of whom met for the first time in the ERC) were borrowing the same resources at increased rates. With the recent influx of relevant materials, peer-advising on resources has also increased and groups of friends can be seen perusing the shelves during ERC open hours and pulling out resources they recommend to each other for studying English. Other evidence of successful learner engagement and out-of-class learner community development was discovered when the advisors were invited to a spring party by some of the learner attendees via Facebook. Not only did one advisor attend and enjoy the party, but through the invite, the advisors stumbled upon a well-established social group of 20 plus friends who had first met in person in the ERC and now use Facebook in English to stay connected. Following this discovery, further attendee activities reflecting the learner community-building aspect of the ERC have been noted, such as organizing drama workshop events and planning and going on an overnight English camping trip (the advisors found out about the latter by viewing a video of the trip on Facebook). Thus, it appears that the decrease in the number of advisors and increase in attendees and consequent changes in advisor practice have helped the ERC become a sort of hub from which social networks develop and expand through authentic interaction in the L2. The result is a community of learners, whose deepening social ties and shared interests enable them to further enhance each other’s out-of-class learning through varied and evolving forms of peer-advising as well as through simply maintaining their friendships outside of the ERC at least partly through the medium of English. This section examines ERC attendance data in order to investigate if and to what extent ERC attendance has increased, both in terms of the number of students visiting as well as the frequency of their visits. Significant increases in these numbers would not only indicate a growing demand at our university for the type of learning experiences offered at the ERC, but moreover may lend empirical support to the observations made in the previous section regarding the growth of an ERC community of out-of-class learners. Since October 12, 2010 the ERC has employed a simple computer sign-in system which allows for much more accurate and reliable attendance data collection compared to the guest book previously used. The present computer ERC sign-in system runs on a computer located just within the entrance of the ERC room so as not to be missed by students (unfortunately, students still occasionally manage to slip through without signing in). When students sign in, they are required to enter two pieces of information: their student identification number and their reason for attending that day (in English). The sample for this study comprises all of the instances in which students logged into the computer sign-in system with a valid student I.D. number during ERC open hours over the 154 days the ERC has been open since October 12, 2010 and gave reasons for attending that excluded words indicating other motives for coming than socializing in the L2 (specifically: book, DVD, borrow, return, newspaper, copy, or check). In this way, 110 (of 409) students were omitted from the study sample, leaving 299 students who accounted for 2026 (of 2393) instances of ERC attendance during the period of study. The reason for omitting entries listing other reasons than socializing was to ensure that fluctuations in students who, for example, came just to borrow and return resources did not create a false positive (or negative) with regard to our question of whether or not the community of students formed through socialization in the ERC has expanded. To determine whether ERC daily attendance has increased significantly over the 154 day study period, a one-tailed, independent t-test was performed to contrast the first 77 days of ERC daily attendance numbers with those of the last 77 days (df=152). Results indicate an increase of 2.86 students (with a lower limit of 1.25 and upper limit of 4.47 at the 95 percent confidence interval), from a mean of 11.44 students per day (SD=4.88) in the first 77 days to a mean of 14.58 students per day (SD=5.23) in the last 77 days. This 24 percent increase in daily ERC attendance was significant at p<.001 with a t of 3.50. Next, although no significant overall increase in attendance per student was found when comparing the first and second halves of the study period, upon more detailed examination, some differences became clear which, although important, could not be analyzed through inferential statistics. Specifically, while the number of students who only attended the ERC once in 77 days remained nearly the same (83 students during the first 77 days versus 81 in the last), the number of students who attended the ERC more than once every two weeks (every 10 days the ERC was open) increased by 73 percent, from only 26 students during the first half of the study period to 45 students in the last half. Meanwhile, there was a modest increase in the number of students who attended at least twice, but not more than once every two weeks, of 25 percent, from 60 students to 75. Thus, the number of students who come back to the ERC after their first visit, and in particular, the number who do so frequently, has increased. In summary, over the past year, both the number of center attendees in general and those who attend the center often has increased. These findings align well with the informal observations made in the previous section of the growth of an ERC-based out-class-learning community. This study explored the growth and benefits of out-of-class learning originating in our self-access center. The exploration highlighted the process by which autonomy-affirming advisor practices and an informal learning environment promote authentic social interaction in the L2 among center attendees. This socialization encourages language development as learners experience a wider variety of patterns of L2 interaction than they would otherwise have access to. For example, learners in the ERC have the opportunity to participate in extended ‘initiation-response’ sequences (rather than only the relatively short three-part IRF pattern typical of teacher-led classrooms) and are able to experiment with a range techniques and strategies required of interactants in order to hold, or take, conversational turns. As social interaction at our center has deepened, it appears to have led to the development and expansion of an out-of-class L2 learning community. This community is characterized by increased peer-advising on language learning, including the recommendation and exchange of English resources, as well as the undertaking of social activities in the L2 outside of the center – thus further reinforcing language learning. Finally, the increases in the number of center attendees and particularly the number of frequent attendees over the past year lends empirical support to informal observations suggesting that this center-based community of out-of-class L2 learners is indeed expanding, and that the overall benefit of our center to the student body is thereby increasing. Leander Hughes is an Assistant Professor at the Saitama University Center for English Education and Development. He is interested in quantitative language research methods and in applying findings in current social psychology to the language learning context. His other interests include computer assisted language learning, learner autonomy, and communicative task effectiveness. Nathan Krug is an Assistant Professor in the Center for English Education and Development at Saitama University. He has research interests spanning the fields of conversation analysis, discourse analysis and CALL. Nathan is interested in language learning and second-language conversation within the computer-mediated environment. Stacey Vye is an Assistant Professor at the Saitama University Center for English Education and Development (CEED) in Japan. Her research interests and publications include reflection, learner and teacher autonomy in language education including the connections between both processes. Benson, P. (2011). Teaching and researching autonomy. London: Longman. Drew, P., & Heritage, J. (Eds.) (1992). Talk at work: Interaction in institutional settings. Cambridge: Cambridge University Press. Freire, P. (1970/1993). Pedagogy of the oppressed. New York: Continuum Books. Hino, N. (1988). Yakudoku: Japan’s dominant Tradition in Foreign Language Learning. JALT Journal, 10(1), 45-55. Kasper, G. (2004). Participant orientations in German conversation-for-learning. The Modern Language Journal, 88, 551-567. Krug, N. P., Edwards Wurzinger, A., Hughes, L. S., & Vye, S. (2011). Language learning through socialization: Diversified use of a self-access center. International Journal of Social Science and Humanity, 1(1), 19-25. Markee, N. P. (2000). Conversation analysis. Mahwah, NJ: Lawrence Earlbaum Associates. Rossatto, C. A. (2005). Engaging Paulo Freire’s Pedagogy of Possibility: From Blind to Transformative Optimism. Boulder, Colorado: Rowman & Littlefield Publisher, Inc.
Sinclair, J., & Coulthard, M. (1975). Towards an analysis of discourse. London: Oxford University Press. Vye, S., Barfield, A. & Anthanasiou, A. (2010). Learning that doesn’t label what ‘kind’ of autonomy is appropriate. Independence IATEFL, 50(1), 21-24. Vye, S., Krug, N. P., Edwards Wurzinger, A., & Hughes, L. S. (2011). Learning through interaction: Four snapshots of an English resource center. The proceedings of the International Conference on Social Science and Humanity Conference ICSSH 2011 (pp.161-165). New York: Thompson ISI/Thomson Reuters.